This is the first in a series of articles by Johannah Willsey exploring makers in the Richmond region. Five years ago, a group of maker friends began gathering each month at one of our studios for an evening of fun and fellowship. We invited more friends and colleagues, cleaned up the shop, and shared a bit of our process and history. Soon, other members of the community, from soap-makers to bread-bakers to curious on-lookers took notice and joined us for these monthly meet-ups. RVA Makers was founded as a way for makers to educate the community about their work, to exchange resources and ideas, and to network with other makers for anything from traditional maker projects to building a maker business. Equally important to our mission is providing exposure for local makers and access to them for the general public. As we continue to grow, we’re working to break down silos between traditional ideas of “disciplines” and foster greater inclusiveness and diversity in our community. In the broader culture, “maker” has come to be associated with new technology, the sort involving lasers and 3D printers and circuit boards. At RVA Makers, we believe makers come in many flavors, both old school and new. As a community, we are open to everyone. If you make something that takes up physical space in the world, or are simply interested in the process, you’re one of us! We meet as a group each month in a different local maker’s space. Our events are open house-style, with time to mingle with makers and other folks alike, as well as explore the space, check out the tools, and see examples of finished work. After a bit, we introduce the host, take community announcements, and then on to the main event: the host demonstration. Demonstrations take many forms from a discussion of the design process to showing off the tools and techniques used to make a physical product. Some of our recent event hosts include potter Tasha McKelvey, children’s clothing maker April Scott, and a tour of the classroom and gallery spaces at Pine Camp Cultural Arts Center. Upcoming hosts include Chadwick & Sons Orchids, woman-owned furniture restoration with SG Woodworks, and artist Katie Crawford. 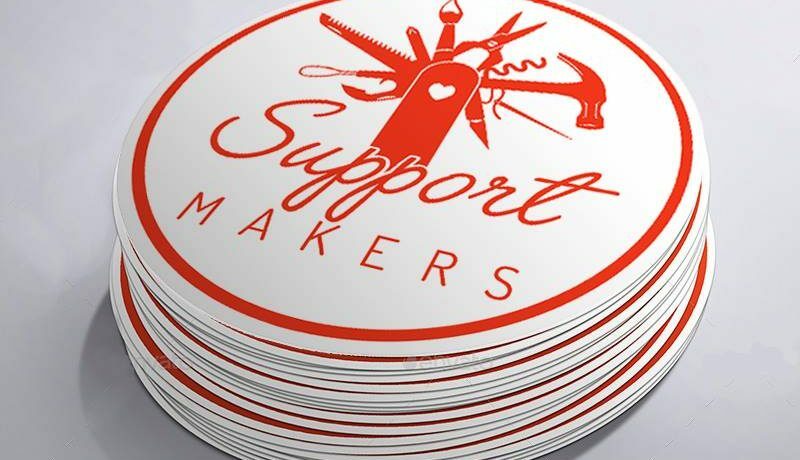 Over the years, RVA Makers has expanded to include an online group for continuing conversation and formalized as a 501c3 non-profit. We continue to grow and learn as a community as well as explore a new maker’s skills and space every month. This year we’re excited to add a shiny new website to the mix as well as a directory featuring both local makers as well as suppliers and other resources. RVA Makers meets the third Wednesday evening of every month from 5:30 to 7:30, and we’d love to have you join us! All our events are free and open to the public. Locations are all over the greater Richmond area, though usually within the city limits. Follow our Facebook page to keep up with events. Better yet, join our online community, the RVA Makers Forum on Facebook, and be part of the conversation.